I will say that putting up the tape was a two person job. John held the laser level in place while I put up the tape along the line. Our laser level had a way to mount it, but it used pins and I didn’t want a billion little whole in my wall. OK, so back to the Frog Tape versus Scotch Blue with Edge Lock. I used mostly Frog Tape because that’s what I had on hand, but I did use plenty of Scotch Blue to get a good idea of both. In this particular picture, you only see a little of the Scotch Blue but there was a lot more used in other areas. 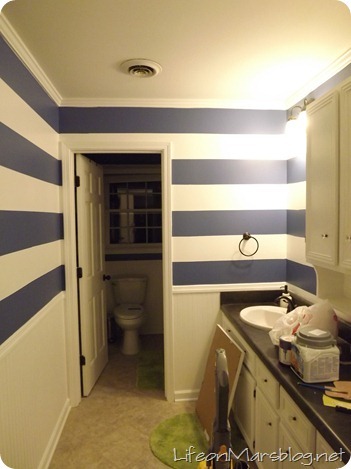 Putting up the tape: Scotch Blue wins this category hands down. In clung better on the first swipe than Frog Tape did. 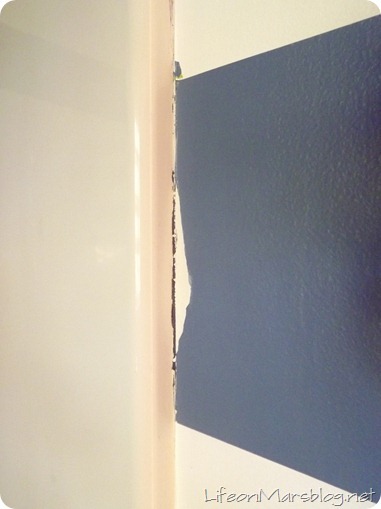 With Frog Tape, we found we needed to go over the tape multiple times before it really stuck, even then while I was painting it was peeling up in spots. This is where the importance of “sealing the lines” comes in. 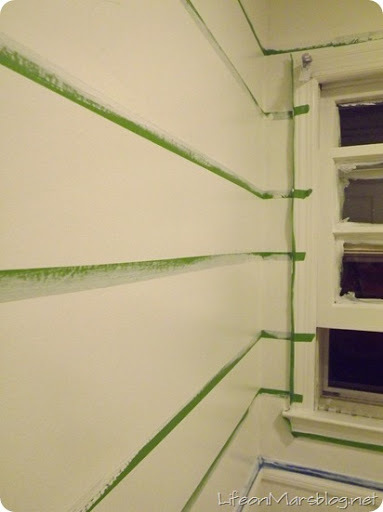 Once your tape is up, cover the lines in your base coat color. That way, if there is any bleed, then the color that bleeds is the color that’s already painted, not the color that is your accent or stripe color. Crisp Lines: I really couldn’t tell a difference between the two. 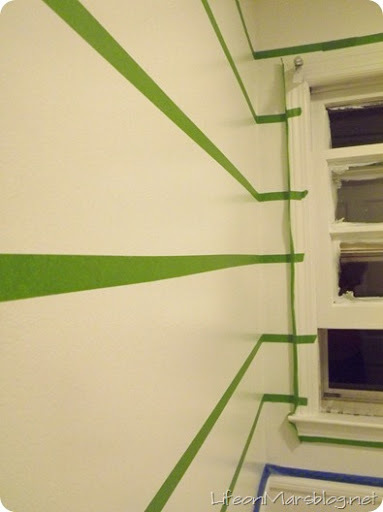 Both had equally crisp lines as long as they didn’t pull off paint (see below). You can see some bleeding at the top, but that’s probably user error. The big problem is the HUGE patch of paint that peeled off along with the tape and that was after using the knife on the edge. I consider him a pretty impartial judge, so in our house, Frog Tape rules from here on out in spite of the issues of it initially not sticking. I guess we’d rather have it not stick enough than to stick too much?